It seems that as each year passes, the world becomes a more and more dangerous place. Since 9/11, private citizens, as well as corporations, have been the targets of terrorist attacks, which historically had only been directed at military targets. As a result, it is more important than ever to make sure that your home, business, school or place of worship is protected against terrorist threats. Blast mitigation cladding is a smart precaution, but it is often ugly and intimidating. 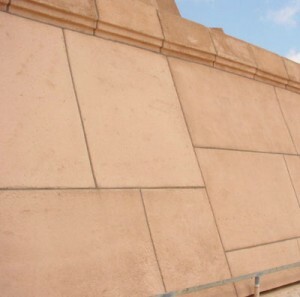 Fortunately, Stromberg has developed a line of blast mitigation cladding that can not only stand up to natural disasters, like hurricanes, but also meets the Department of Defense’s Unified Facilities Criteria UFC 4-010-01 “Minimum Anti-Terrorism Standards for Buildings.” However, unlike similar cladding, Stromberg’s cladding is remarkably non-intrusive, and is hardly noticeable as an anti-terrorist precaution. Explosions are very difficult to absorb, instead, it is important to deflect and disperse blasts. Our flexible GFRC dissipates the force of explosions and impacts by flexing where other materials, like concrete, would shatter, crack or crumble. In laboratory settings, our GFRC blast hazard mitigation cladding has exceeded 10 psi peak pressure and 89 psi-msec impulse. Additionally, our cladding panels are significantly more lightweight than our competitors, meaning they require significantly less architectural support, and they are easier to install. Not only is our cladding lightweight, but it is also attractive and entirely customizable. GFRC is an incredibly versatile material, and in the hands of master craftsmen, it can imitate nearly any building material. You can clad your building in GFRC that looks like granite, sandstone, marble, even wood or metal, and most people would never guess that your building is bomb-resistant. Stromberg GFRC offers you 30 years of experience on over 1400 successful projects. We can help with detailing, specifying or designing the GFRC for your project. For more information and assistance with your design challenge, please call us at (903) 454-0904 today or email us at info@strombergarchitectural.com.